New World Library, 9781608685509, 336pp. If you regularly eat when you're not truly hungry, choose unhealthy comfort foods, or eat beyond fullness, something is out of balance. Recent advances in brain science have uncovered the crucial role that our early social and emotional environment plays in the development of imbalanced eating patterns. When we do not receive consistent and sufficient emotional nurturance during our early years, we are at greater risk of seeking it from external sources, such as food. Despite logical arguments, we have difficulty modifying our behavior because we are under the influence of an emotionally dominant part of the brain. The good news is that the brain can be rewired for optimal emotional health. 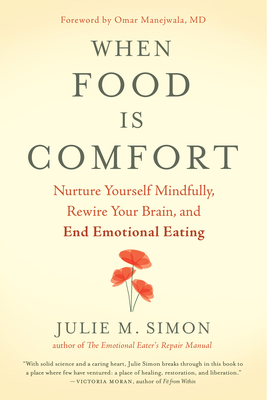 When Food Is Comfort presents a breakthrough mindfulness practice called Inner Nurturing, a comprehensive, step-by-step program developed by an author who was herself an emotional eater. You'll learn how to nurture yourself with the loving-kindness you crave and handle stressors more easily so that you can stop turning to food for comfort. Improved health and self-esteem, more energy, and weight loss will naturally follow. Julie M. Simon, MA, MBA, LMFT, is a licensed psychotherapist and life coach with more than twenty-seven years of experience helping overeaters stop dieting, heal their relationships with themselves and their bodies, lose excess weight, and keep it off. She is the author of The Emotional Eater's Repair Manual and the founder of the popular Twelve-Week Emotional Eating Recovery Program. She lives in Los Angeles.